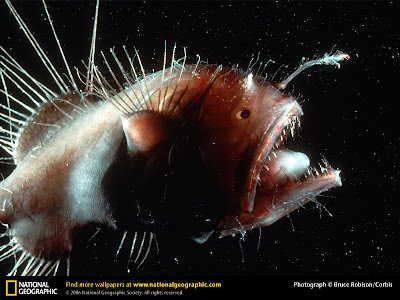 A female Angler Fish can carry more than 6 males on her body at once! 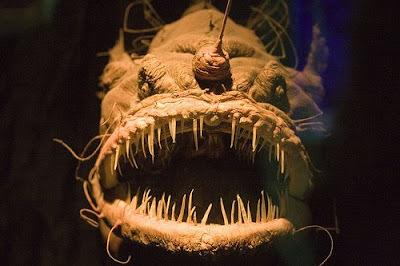 Also known as the Monkfish or Headfish in some places of the world, the Angler fish also has a nature lure coming out of it's head which lights up to attract it's prey... What an amazing, but very ugly fish! 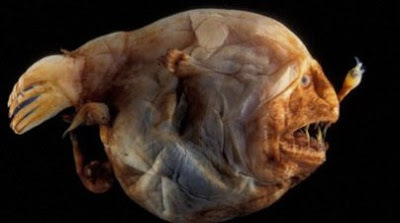 Believe it or not the Deep Sea Angler Fish is also considered to be very tasty. In fact its flesh in the tail has been compared to lobster! To see the complete deep sea documentary click here! Now that is one ugly mug! Aww!! They are so cute!! I love them!! None of the fishes illustrated above are Lophius piscatorius. The latter belongs to the family Lophiidae. The fishes illustrated are ceratioid or midwater anglerfishes, not lophiid anglerfishes. Only a few of the 11 families of ceratioid anglerfishes have ectoparasitic males. There are ca. 35 genera and 158 species of ceratioid anglerfishes. cool fish are so cool all fish. ocean tip , oceansunfish like to sunbathe.